LA PAZ, Bolivia (CNN) -- Bolivian police Thursday foiled a plot to assassinate President Evo Morales, the country's vice president and other top government officials, Morales said in Venezuela, where he is attending a summit. 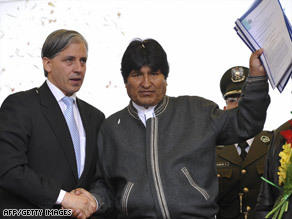 Bolivian Vice President Alvaro Garcia Linera, left, and President Evo Morales appear in La Paz earlier this week. The plot involved Irish and Croatian nationals as well as Bolivians, Vice President Alvaro Garcia Linera said at a separate news conference in La Paz. When police moved in to arrest the five suspects at a hotel in the eastern Bolivian city of Santa Cruz, they became embroiled in a 30-minute gun battle, Morales said. Three of the gunmen were killed and two were arrested. Officials recovered heavy armaments at a nearby warehouse that authorities said belonged to the gunmen. The five are suspected of involvement in the bombing of Catholic Cardinal Julio Terrazas' house in Santa Cruz a day earlier, Garcia Linera said. No one was injured in that attack. Garcia Linera called the suspects "a dangerous gang of mercenary terrorists." Morales said he traveled to the summit of leftist Latin American leaders in Venezuela although he "had information that there would be an attempt." Opposition leaders in Santa Cruz were unconvinced a plot existed, saying the government was trying to use the apparent danger to silence critics. The leaders pointed to previous alleged assassination plots based on what they called flimsy evidence. "These things happen when the president is not in the republic," said critic Luis Nunez. "They're trying to scare those who think differently." Santa Cruz, an opposition stronghold, is about 340 miles (550 kilometers) east-southeast of La Paz, the Bolivian capital. Morales made the announcement in the seaside city of Cumana, Venezuela. He was flanked by Venezuelan President Hugo Chavez, who had his arm around Morales' shoulders, and Cuban leader Raul Castro.